A magnetar called SGR 0418+5729 (SGR 0418 for short) has been shown to have the lowest surface magnetic field ever found for this type of neutron star. Magnetars have surface magnetic fields that are usually ten to a thousand times stronger than SGR 0418's. Data from Chandra, XMM-Newton, Swift and RXTE was used to measure the surface magnetic field. These results have implications for understanding supernova explosions and the number and evolution of magnetars. The only plausible source for the energy emitted in these outbursts is the magnetic energy stored in the star. Most magnetars have extremely high magnetic fields on their surface that are ten to a thousand times stronger than for the average neutron star. New data shows that SGR 0418 doesn't fit that pattern. It has a surface magnetic field similar to that of mainstream neutron stars. 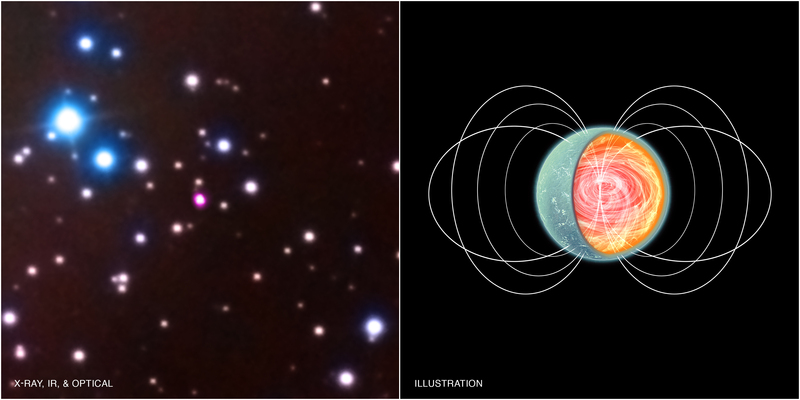 In the image on the left, data from NASA's Chandra X-ray Observatory shows SGR 0418 as a pink source in the middle (mouse over the image above). Optical data from the William Herschel telescope in La Palma and infrared data from NASA's Spitzer Space Telescope are shown in red, green and blue. On the right is an artist's impression showing a close-up view of SGR 0418. This illustration highlights the weak surface magnetic field of the magnetar, and the relatively strong, wound-up magnetic field lurking in the hotter interior of the star. The X-ray emission seen with Chandra comes from a small hot spot, not shown in the illustration. At the end of the outburst this spot has a radius of only about 160 meters, compared with a radius for the whole star of about 12 km. The researchers monitored SGR 0418 for over three years using Chandra, ESA's XMM-Newton as well as NASA's Swift and RXTE satellites. They were able to make an accurate estimate of the strength of the external magnetic field by measuring how its rotation speed changes during an X-ray outburst. These outbursts are likely caused by fractures in the crust of the neutron star precipitated by the buildup of stress in the stronger magnetic field lying below the surface. SGR 0418 is located in the Milky Way galaxy at a distance of about 6,500 light years from Earth. These new results on SGR 0418 appear online and will be published in the June 10, 2013 issue of The Astrophysical Journal. NASA's Marshall Space Flight Center in Huntsville, Ala., manages the Chandra program for NASA's Science Mission Directorate in Washington. The Smithsonian Astrophysical Observatory controls Chandra's science and flight operations from Cambridge, Mass. Coordinates (J2000) RA 04h 18m 33.90s | Dec 57° 32´ 22.90"
Observation Time 45 hours 52 min (1 day 21 hours 52 min). I saw a good program about this very subject on the History 2 channel. A very good program and quite educational. I just want to check if images on NASA/Chandra sites are considered public domain (I am working on a popular astronomy site) as long as they are credited as indicated in the image on your web site(s)? Everything that is in space is interesting because it is what God has created. Thank you for teaching it because we can see how small we are compared to space. God bless you. A type of neutron star that has a relatively slow spin rate and generates occasional large blasts of X-rays. X-rays from the Chandra X-ray Observatory, Optical data from the William Herschel telescope in La Palma and infrared data from NASA's Spitzer Space Telescope. About 3 light years across. X-rays are pink, optical luminosity and infrared red, green and blue.